Indian Prime Minister Narendra Modi on 31 may met Spanish King Felipe VI at The Palace of Zarzuela on the outskirts of Madrid, near the Royal Palace of El Pardo. "A royal greeting! 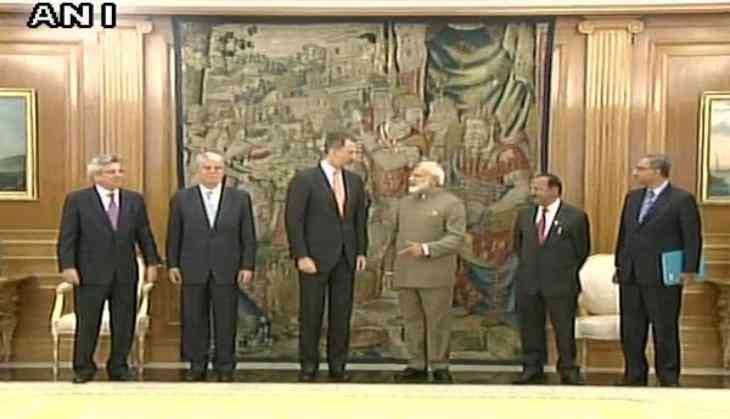 PM @narendramodi calls on His Majesty King Felipe VI of Spain at Palacio de la Zarzuela," Ministry of External Affairs (MEA) spokesperson Gopal Baglay tweeted. Prime Minister Modi also met Spanish President Mariano Rajoy at the Moncloa Palace earlier in the day. Earlier, India and Spain also signed seven agreements across multiple sectors following delegation-level talks, co-chaired by Prime Minister Modi and his Spanish counterpart Mariano Rajoy in Madrid. Prime Minister Modi, who is on a two-day state visit to Spain, had arrived in Madrid on 30 may. He is the first Indian prime minister to visit Spain since 1988.